Neu Dynamics has over 40 years of injection tooling experience for all types of industries. Our focus on close tolerance tooling with complicated actions enables us to provide the high-quality injection molds demanded by the medical industry. 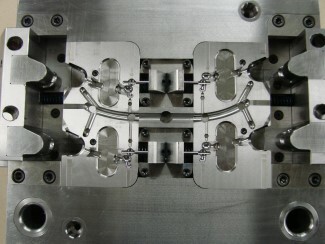 Neu Dynamics has supplied medical device manufacturers with a variety of tooling from hand-loaded catheter over-molds, to multiple-cavity valve-gated production molds manufacturing complex parts. Whether you are looking for prototyping, production, sampling and even repair, NDC is your source for quick, cost effective solutions. Neu Dynamics also has full in-house design and manufacturing capabilities to produce electrodes from a customer’s solid part models, allowing our customers to take advantage of turnkey solutions that are fast, affordable and accurate. We have high speed milling technology and can work in Graphite or Copper. We will supply 3R or EROWA fixturing or we can work from a customer’s fixturing.